This Nike KD 8 Elite Black colorway is another Playoff exclusive pairs made for Kevin Durant to wear during the playoffs. 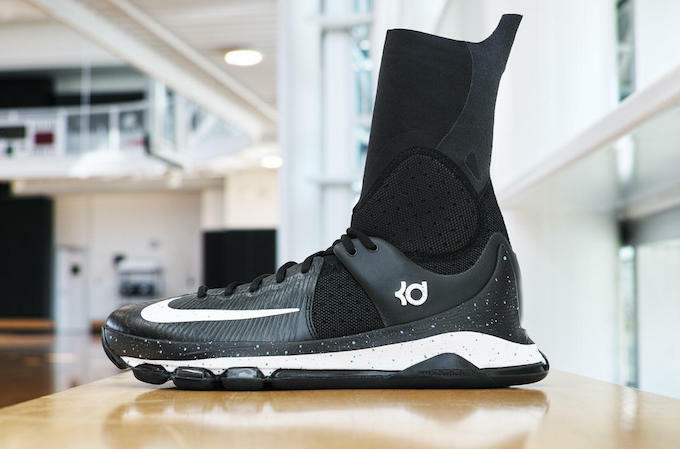 Dressed in a full Black-based upper with White detailing hitting the Nike Swoosh and KD branding, along with speckle detailing on the midsole in Black and White. The Elite version of the Nike KD 8 is upgraded with a calf-length compression sock, full-length visible Nike Zoom Air cushioning and Flywire technology with Kevlar® aramid fiber. Strategically placed non-stretch woven materials ensure a snug, secure fit while foam provides protection and comfort. Check out the additional images below and look for Kevin Durant to wear this Nike KD 8 Elite “Black” colorway during the NBA 2016 Playoffs. There is no word on these releasing anytime soon.